(Bloomberg) -- European plans to cut the greenhouse gases emitted by the power sector are working. The trouble is, that’s the easy part. Increased generation from renewable energy sources and the gradual decline of coal in the overall energy mix saw emissions from power stations in the EU drop 8 percent in 2018, according to BloombergNEF research. That was quadruple the drop seen by cement and steelmakers. Emissions in other industries rose. The discrepancies highlight the challenges policy makers face as they try to accelerate deep emissions cuts set out in the Paris Agreement without damaging supply chains and industry. In transport, aviation emissions rose for a fifth straight year, underscoring the airline industry’s rising contribution to greenhouse gases that damage the climate. 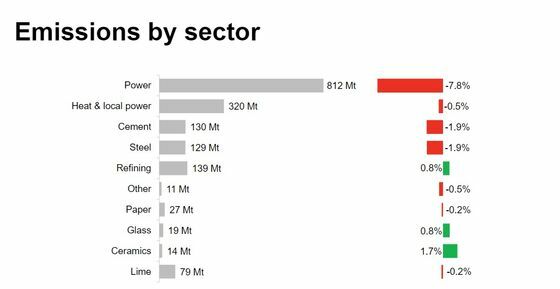 While there were drops of under 1 percent in the heat and paper manufacturing sectors the making of glass and ceramics saw an increases and the refining sector produced 139 million tons of carbon dioxide in 2018, a 0.8 percent increase. Total emissions covered by the region’s carbon market fell last year by 3.8 percent after a surprise rise in 2017. Globally, carbon emissions from fossil fuel use hit a record last year after energy demand grew at its fastest pace in a decade, reflecting higher oil consumption in the U.S. and more coal burning in China and India.